I’m through using black plastic edging in both my yard and the yards of clients. Sick of the look. The best, commercial grade edging, the nice 6” wide stuff that doesn’t heave out from frost, leaves a full one-inch band of black all around your beds, even when installed properly. When edging lawn, it’s plenty visible for at least four days after mowing. The worst look is black plastic edging in and around stone landscapes, particularly when you want a clean, narrow edge along a gravel pathway. That round, black tube that runs along the top of plastic edging looks like hell. So I’ve switched over to some new products, aluminum YardEdge and ProLine, and I’m loving them. I just installed them for the first time – in my own yard – last week, and installation was slick and the look first rate (though you have to look close to even see the edging). Both products are wonderfully flexible – you can make tight or broad curves, and the product naturally flexes to your will. Connectors are available for ninety-degree corners, though why one would have a ninety-degree corner in one’s design is of course beyond me. In the brochure photo of YardEdge shown, you can see the 1/8” top edge because the product has the mill finish (natural aluminum), but it comes in a dark green, and that’s what I’ve been using. The color finishes are electrostatically applied, baked on acrylic. Six foot lengths by four inches wide/deep. Leave a half-inch or less above ground and the product all but disappears. For edging gravel, you could go with the mill finish, or black, for that classic English/Italian look. Second photo shows the green, and the patented interlocking system. Edging is held in place with 12” stakes. 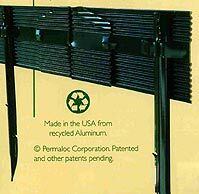 The company – Permaloc Corporation in Holland, Michigan – also manufactures the ProLine aluminum edging system (8’ to 16’ lengths) in colors mill, black, green, and bronze. I’ve chatted with the folks at Permaloc and their testing shows excellent resistance to frost heave in northern climates, when properly installed. Installation is a tad quicker and easier than installing black plastic edging. Like many better-quality landscape accessories, this edging is not inexpensive. Retail, YardEdge is going to run you around $1.50 per running foot. If that works with your budget, it’s well worth it. Find out more at www.permaloc.com.